NASA began planning MSL’s mission in 2003. Over the past eight years, scientists and engineers developed, built and tested Curiosity, a robotic behemoth that will take planetary exploration to a new level. 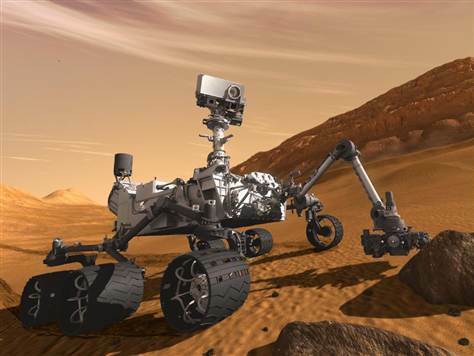 At 1 ton, Curiosity weighs five times more than each of its immediate Mars rover predecessors, the golf-cart-size twins Spirit and Opportunity, which landed on the Red Planet in January 2004 to search for signs of past water activity. While Spirit and Opportunity each sported five scientific instruments, Curiosity boasts 10, as well as a drill that will allow it to access the interior of Red Planet rocks. The huge rover will use all of this gear to gauge the past and present habitability of its Martian environs. It will look for carbon-containing compounds — the building blocks of life as we know it — and assess what the Red Planet was like long ago. MSL is not a life-detection mission, but it will lay the foundation for future efforts that could hunt for evidence of microbial Martians, officials said. “We bridge the gap from ‘follow the water’ to seeking the signs of life,” said Doug McCuistion, head of NASA’s Mars exploration program. Friday’s launch will kick off an 8 1/2-month cruise to Mars, with the MSL spacecraft arriving at the Red Planet in August 2012. All planetary landings make mission scientists and managers sweat a little bit, but Curiosity’s will likely be more nerve-wracking than most. A rocket-powered sky crane will lower the huge rover to the Martian surface on cables — a method that has never been tried before. The sky crane performed well in full-up computer simulations, so it should work on the Red Planet, officials said. Curiosity will touch down at Gale Crater, a 100-mile-wide (150 kilometers) hole in the ground with a mysterious 3-mile-high (5 km) mountain rising from its center. The rover will poke around Gale, scrutinizing and sampling the dirt and rocks it encounters. Curiosity’s mission is designed to last for about two Earth years, but it wouldn’t be a shock if the rover kept chugging along for significantly longer, officials said. Spirit and Opportunity, after all, far outlasted their planned three-month mission lifetimes. NASA just declared Spirit dead this year, and Opportunity is still cruising around Mars, checking out a huge crater called Endeavour. And Curiosity is powered by radioisotope thermoelectric generators — which produce electricity from the radioactive decay of plutonium — rather than solar cells. The rover should thus be able to handle the harsh Martian winters well, Theisinger said. So NASA officials expect Friday’s launch to mark the start of something big.